It’s a shame Quora doesn’t get more traffic considering how fun and informative it is. So to raise awareness, today Quora launches an embeddable quote feature that lets any website host its content. 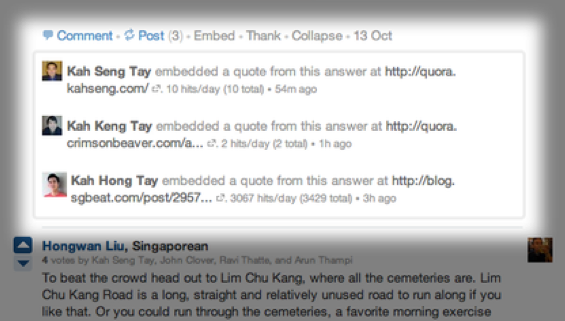 The embeds make citation easier, and trackbacks show authors where their questions and answers are ending up. I’ve embedded Quora’s announcement of the feature in this post which will show you how it looks. comScore pegs Quora at 1.5 million monthly uniques, up 300% in the last year, but it’s still far from becoming a household name. Like Twitter’s push to get tweets on TV a few years ago, Quora embeddable quotes could get it the off-site eyeballs it needs to make learning more mainstream. Now whenever you’re browsing Quora, an embed button will let you grab the code necessary to stick a question and answer on your site. You can choose between a narrow or original layout, and select the exact excerpt of the text you want. That’s handy considering how long some of the quantum mechanics answers can be. Embeds shows the author, answer text, what question they were responding to, and the number of upvotes. The embeds will even render on mobile. Beneath answers that have been embedded, a list of trackbacks appears so authors can follow up and see how their work is being integrated into news stories and blogs. And if a question or answer is edited on Quora after being embedded elsewhere, the embed will indicate there have been changes made — though it won’t automatically change what’s already been embedded. The whole system will clear up some cases of confusion about how to cite Quora. Sites can just embed what they want, and that serves as proper attribution. Quora’s TOS allows other sites to freely repurpose its content as long as they link back, though embeddable quotes are still guided by the “Not For Reproduction” option that gives authors jurisdiction to use copyright law to stop anyone from reposting their words. Quora tells me it’s already seen its content featured in over 200 media outlets (we’re one of them), and it frequently works with Forbes, The Huffington Post, and Slate to help them create articles out of its answers. But most of the time, journalists and bloggers would simply copy and paste text into their sites, which denies Quora the branding it needs to grow. Getting more people visiting and making frequent trips has been Quora’s big mission this year. It’s gotten a huge boost from its smart integration with Facebook Open Graph, that auto-shares when you follow questions, add answers, or vote for responses. It launched an embeddable “Follow” button, also hired two growth hackers — Andy Johns formerly of Twitter and Facebook, and Rob Matei of Zynga. With any luck, rather than just getting the value out of Quora when its quoted as plain text across the web, readers will click-through embedded quotes, recognize the joy of knowledge, and become regular Quora users.